What is cellulose and are all forms of Cellulose film the same? Cellulose is the substance that makes up most of a plant’s cell walls. Since it is made by all plants, it is probably the most abundant organic compound on Earth. Cellulose is a biodegradable polysaccharide. A polysaccharide is a type of carbohydrate. No, all forms of Cellulose film are NOT the same. There are several forms of materials made from or derived from cellulose,. They have very different properties and it can be very confusing; From more familiar forms of cellulose such as paper, cotton and wood pulp etc, to refined forms, such as microcrystalline cellulose. There are also forms of cellulose or cellulose derived materials that can be made into a clear film, which can be used to make glitter. Such films can be made by reacting cellulose with other chemicals to produce a new material, such as Celluloid and Cellulose Acetate. Other film materials can be made from the cellulose extracted from wood pulp, such as traditional regenerated cellulose (Cellophane™) and MRC (modified regenerated cellulose, uniquely used in Bioglitter®). Below is more detail on these materials and information our view on their suitability to be used in Bioglitter®. Micro-crystalline Cellulose – is a white powder product, a refined form of cellulose usually made from wood pulp. Micro-crystalline cellulose is commonly used in cosmetics as a plastic-free exfoliant. In other industries, it’s used a filler or bulking agent. This form of cellulose is not suitable for making a flexible transparent film from which glitter can be manufactured. Celluloid is generally considered the first synthetic thermoplastic, becoming commercially available in the 1860’s. It was the first picture or photographic film, however, it was found to be highly flammable and as a result very dangerous. Cellulose Acetate or Cellulose Triacetate is also more commonly known as Acetate. It is made by reacting cellulose with acetic anhydride to produce a new substance, Cellulose Acetate. It was developed as a safer alternative to Celluloid and became commercially available in the 1920’s. Cellulose Acetate is industrial and home compostable, BUT, it does not biodegrade in the natural environment and is also a synthetic thermoplastic. Cellulose Acetate is used to make cigarette filters and spectacle frames. Cellulose Acetate can take up to 12 years to degrade in natural environmental conditions and the environmental pollution created from cellulose acetate cigarette filters is very well documented. It’s our view to Cellulose Acetate is similar to that of PLA. Cellulose Acetate makes complete sense for used as eco-friendly material for packaging. Packaging materials are physically large enough to be placed in a compost bin. However, it is physically not practical to place small glitter particles in a compost bin and therefore, the first reasons why we feel Cellulose Acetate is not suitable for use in Bioglitter®. The second reason is because it is a synthetic thermoplastic. Regenerated Cellulose was Introduced in the 1930s as a transparent film used in food wraps and candy wraps. In the 1960s-1970s with the advent of lower cost and easier to handle oil derived plastic films such a polyester, polythene etc, it became less popular. In the US and some other countries “Cellophane” has become genericized, and is often used informally to refer to a wide variety of plastic film products, even those not made of cellulose, such as plastic wrap. It was assumed that traditionally regenerated cellulose, as it was based on cellulose, would have good biodegradability characteristics, however, when put to the test it was found that this form of cellulose film had very poor biodegradability performance. It does not pass recognised biodegradability standards, not even industrial composting standards EN13432 and ASTM D6400, the least challenging of conditions for biodegradability. Manufacturing a glitter based on traditional regenerated cellulose (Cellophane™), due to its poor biodegradability performance, does not meet the basic ecological requirement of Bioglitter® products, hence why we discounted this technology it in our development process. MRC – Modified Regenerated Cellulose, the base film used Bioglitter® – 2000’s – A high tech and modern version of traditional regenerated cellulose unique to Bioglitter®. Natural cellulose is extracted from wood pulp, the prefered type being eucalyptus and then the cellulose is regenerated by casting into a clear film. Specifically developed and designed to biodegrade in both industrial man-made composting environments and also in natural environments. It is manufactured from sustainable resources, it is not a thermoplastic and it biodegrades extremely well; certified both industrial compostable (EN13432, EN14995, ASTM D6400, ISO 17088) and home compostable (OK Compost Home), Waste Water biodegradation approved to ISO15986 and also marine biodegradation approved to ASTM D6691-09. 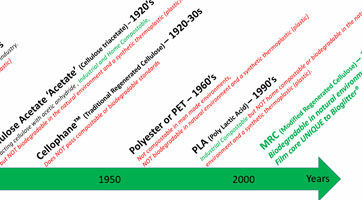 Summary – Even though they all have cellulose in the name; cellulose acetate, traditional regenerated cellulose and the ‘MRC’ in Bioglitter® are completely different in biodegradability performance and in the case of Cellulose Acetate its classification as a synthetic thermoplastic. 1 – Plastic free, so it’s no longer a microplastic. 2 – Biodegradable in the natural environment, so it leaves minimal or no trace.